No Swiss stamps were ever issued specifically for use on mail carried by the German airship GRAF ZEPPELIN, however the airship made many flights to and from Switzerland during the late 1920's and early 1930's. 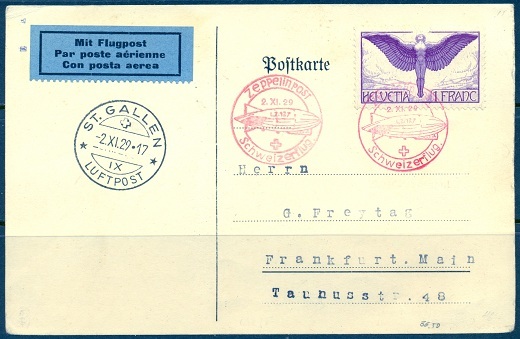 Mail originating from Switzerland and carried by the airship Graf Zeppelin was normally franked by regular definitive or airmail Switzerland stamps. The postcard shown on this page was carefully franked to receive a commemorative Graf Zeppelin flight cancel, and it was obviously intended to be a philatelic souvenir for the friend of a Bern resident. It is franked with 75 Centimes in Swiss stamps , which I don't think would have gotten it very far, as the German postage rate for a postcard carried on one of its North American flights was 2 Reichmarks. When you think about it, ALL ZEPPELIN COVERS and CARDS are "philatelic" in nature. Two days before this card was postmarked on board the Graf Zeppelin, the World's financial markets began to collapse and the Great Depression began. In fact, most existing Zeppelin postal history items were created during the Depression Era, when most people in the world had little or no money to spare at all. Stamp collectors and stamp dealers were actually responsible for most of the Zeppelin covers that are in existence today! The card shown above was written on October 25, 1929 and franked with two Swiss airmail stamps and a tête-bêche pair of the 10 C. William Tell definitive stamp. The card was canceled, during the flight, with two red commemorative cancels reading: "Zeppelinpost / Schweizerflug / 2 XI 29". There is also a "ST. GALLEN / LUFTPOST / 2 XI 29" transit cancel from the same day. 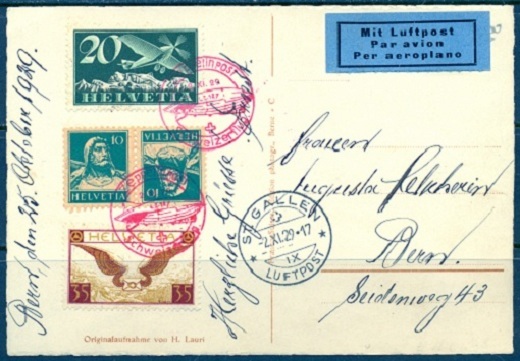 Swiss zeppelin covers and cards can get a bit pricey, as many of the Swiss airmail stamps of the 1920's, especially the high values, are very expensive in used condition singles and used on cover, as opposed to their German counterparts. A card, such as the one on this page, can be acquired for around $50 to $60. Swiss cards and covers carried on the North American, South American, and Around-the-World flights of the Graf Zeppelin are much more expensive though. Collecting Swiss franked Zeppelin flight covers and postal history can make an impressive addition to any Switzerland or Swiss airmail collection. 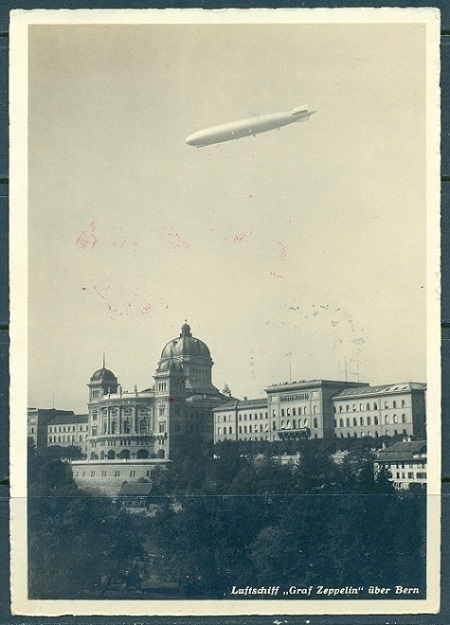 Shown above is another card, with different franking, from the same 1929 Graf Zeppelin flight.